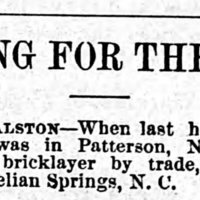 Alston was last heard from in July 1890 in Paterson, New Jersey. “A. Brinkley searching for Harry T. Alston,” Information Wanted Ad, The Appeal (St. Paul and Minneapolis, MN), April 25, 1891, Last Seen: Finding Family After Slavery, accessed April 19, 2019, http://informationwanted.org/items/show/3415.